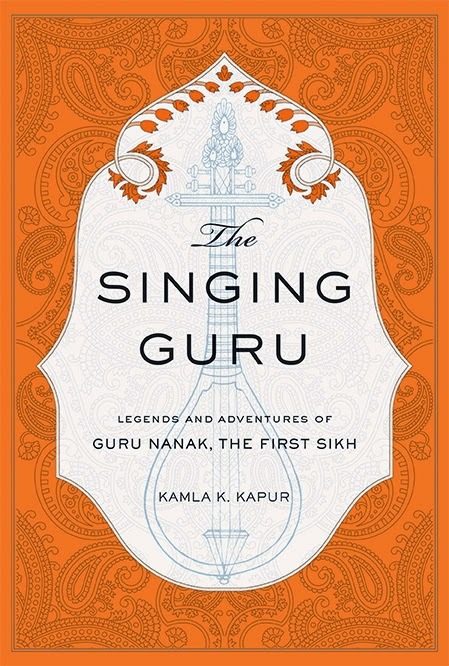 Today we are interviewing Kamla K. Kapur, author of the historical fiction THE SINGING GURU, Legends and Adventures of Guru Nanak, the First Sikh. The Singing Guru is about an unhappy man’s journey from conflict to joy and peace. Mardana, who was historically the rababi, or rabab player (a medieval stringed instrument also called a rebec) of Guru Nanak, (1469-1539) the founding father of Sikhism, traveled with the master on his extensive journeys from India to other countries. Mardana’s odyssey, full of many dangerous adventures, parallels his spiritual and psychic journey from the animal end of the human spectrum to a man in the process of transformation and liberation. What inspired you to write a novel about the life and travels of Guru Nanak? My father always wanted me to write this book. I grew up in a fairly traditional Sikh family. My mother is one of the many sixteenth generation descendants of Guru Nanak and I heard a lot of the stories that are embedded in the larger narrative arc of the book. I am eclectic about spiritual wisdom, and glean it from all sources. I have written two books from the Hindu and Muslim traditions: Ganesha Goes to Lunch (now reprinted in India as Classics from Mystic India) and Rumi’s Tales from the Silk Road (published in India as Pilgrimage to Paradise: Sufi Tales from Rumi). This eclecticism and egalitarianism is an integral part of Sikhism. The Sri Guru Granth Sahib, the Sikh holy book, contains the songs of seven Sikh gurus, including Guru Nanak, who composed and sang, and the songs of fifteen Hindu and Sufi saints. Guru Nanak’s definition of a religious person is “one who looks on all as equal.” Brotherhood and sisterhood of all on this planet is Sikhism’s basic tenet; music is at its heart. What better subject to write about than one I resonate with? Sikhs, obviously, because the old, hackneyed stories they grew up with have become uninteresting clichés. My book shows Guru Nanak in a new, modern light, highlighting his spiritual relevance even today. I hope it will be of particular interest to the younger generation of Sikhs who will be able to relate to their roots in a new way. It will also be of value to those interested in Eastern spirituality and the oriental tale. The book comes from a different, an unknown tradition whose nondenominational approach to spirituality and joyous acceptance of all aspects of life is particularly relevant in today’s fragmented and conflicted world. The book will also appeal to any spiritual seeker who wishes to know about a wonderful new (yet obscure) religion and to learn very simple truths that make the difference between suffering and joy, between living life blindly, or with awareness. The word ‘Sikh’ means a devotee and disciple of the ultimate Guide of all Guides, a student who is always eager and passionate to learn how to grown into his or her full potential as a true and conscious human being. Guru Nanak’s definition of a religious person is simply someone who treats all as equals. This is a lesson we all need to learn, over and over again. Thomas Hoover, author of Zen Culture and The Moghul, compares The Singing Guru to The Odyssey. Did you set out to write a novel with such an epic scale? Or did it just develop that way as you wrote? It was a combination of both. When you begin writing a book you don’t really know what direction it is going to take. It is still in an inchoate state. At least, that’s how I work, not with a plan, but with a vague idea that then becomes amenable to a plan. After a lot of trial and error it begins to take form, and it is at this stage that your knowledge of works that have influenced you comes to your aid. Thomas Hoover’s response pleased me tremendously and I am happy that he made the connection. But the epic scale is inbuilt into the book. The Singing Guru is the first book of the Sikh Saga. I plan to carry the story through another nine generations – which, in fact, is how it panned out historically. I did not realize while I was writing The Singing Guru that I had stumbled on the mother lode. You have written in other genres. What is the primary difference between writing for the stage and writing a novel, for example? I write in all genres – plays, poetry, essays, fiction. The subjects, ideas, feelings, characters that interest me, come with their own forms. The subjects with the most psychic or social conflict come to me as plays. Conflict lends itself well to dialogue because there are two or many more opposing points of view. This is not to say that plays are only about disembodied opposing points of view. Characters, embodying the conflict, are central to what happens on the stage. Since plays progress through dialogue and action, and since their performance has a communal interface, they are pared down to something that can take place in a few hours. Plays are much more time-bound, dense, and compact. Fiction, on the other hand, can ramble, something I like to do. They can include description, thoughts (which can also be expressed as soliloquies in plays), meditations, cogitations, philosophizing in addition to dialogue and character. Fiction is the most capacious of the genres and I love it for these reasons. But of course, you have to be careful not to abuse its freedom to the point of boring your readers. Art, above all, is the imposition of limits on nature, and you have to be aware of this if a project is to succeed – by which I mean, find its audience. Matters of the heart and soul are best suited for Poetry, which goes deeper into the human spirit than the other genres. It is a soliloquy of the soul with itself. Having said this, though I have never had to debate about whether a particular subject should be expressed in a play or fiction or poetry – like I said, they come clothed in their forms – I use the strengths of each genre in the others as well. Dialogue is an integral part of my fiction because dialogue, more than any other technique, propels the story into the present, makes it come alive in the Now. My last book of poems, As a Fountain in a Garden, is one long monologue, comprised of smaller ones, and is in the form of a dialogue between a woman and the ghost of her husband who committed suicide. How was the process of writing The Singing Guru different from that of the other books you’ve written? The subject is different, the process remains the same. Having said that, I have to admit that initially there was a lot of anxiety in me about writing it. Having said that, I have to admit that my survival has depended upon just such a mooring, my faith as I practice it: gurbani, the words of the Sikh Gurus and Bhagats in the Granth Sahib, the Sikh holy book. Words have been my salvation, whether the ones I write and explore through the process of writing, or the words of the Gurus. When you have two competing loyalties of two equally important allegiances, there is bound to be conflict. It was this: do I write this book as an idolater? Though this was never an option, I did mistake it for one frequently while writing this book. It was made more complex by the knowledge that Sikhs, like upholders of any other religion, can be quite possessive of their own canons and do not brook disagreement or other interpretations. I have to admit that there was some fear. I had to finally accept and acknowledge to myself that I am a writer, first and foremost. My primary allegiance is to the God of Writing, and I belong (in my husband, Payson R. Stevens’s words) to the Nation of Writers. Guru Nanak also conceived of God as the Arch Writer, the Playwright of the drama of life. Where can potential readers learn more about The Singing Guru? I am currently finishing up the first volume of a fantasy, Malini in Whirlwood that has been in the making for forty years! I have also written about half of the next book of the Sikh Saga, called The Dancing Guru. Is there anything else you’d like potential readers to know about The Singing Guru? I would like to talk a little bit about Guru Nanak, the founder of the Sikhs. He reunited mankind with the forces of nature. He said of himself that he had no more caste or race than wind or fire; he blasted through the petty, parochial, limited, superstitious, and encrusted version of God, cut through the delusions and ignorance that separate humans from each other, saw through the skin of appearance to the light that informs every breathing thing, shattered the prescriptions and constrictions of rituals and idolatry, and sought at the source the transcendent and immanent energy infused through the micro- and macrocosm. Nanak’s is a personal, direct, and unmediated Way that places no barriers between the lover and the Beloved. In his songs, Nanak rends the perceptual veils that blind us to the truth that the Lord of the cosmos and the human heart are one. His message is very relevant to us today. Kamla K. Kapur (aka Kamal Kapur) was born and raised in India, and is a citizen of the United States. She got her Bachelor's in English Honors from India, and her Masters' Degree in literature from Kent State University, Ohio, USA. She also took classes in creative writing from the University of Iowa, and the University of California in San Diego. During her time in the USA, many of her poems were published in prestigious American journals and quarterlies. She returned to India (1974-78), was a freelance writer for The Times of India, The Hindustan Times, and The Tribune, and taught English Literature at Delhi University. Her poetry and short stories were published in the original English and in Hindi and Punjabi translation in journals and magazines. In 1977, she won two National Awards, The Sultan Padamsee Award for Playwriting in English. Her full-length play, The Curlew's Cry, a bi-lingual play, was produced by Yatrik, New Delhi. A Punjabi translation of her play, Clytemnestra was produced by The Company in Chandigarh. Her award-winning Zanana, was produced at the National School of Drama, New Delhi. Seven of her plays were published in Enact, New Delhi. Her full length plays, Hamlet's Father, Kepler Dreams, and Clytemnestra were showcased at the Marin Shakespeare Festival in San Francisco, Gas Lamp Quarter Theatre in San Diego, and Dramatic Risks Theatre Group in New York, respectively. The New Mexico Arts Division selected her as the Playwright in Residence for two years. In May 2014, her award winning play, Kaamiya, was produced by Ank, Mumbai. It is currently traveling to various festivals in India. Kamla has two books of poetry to her credit: the critically acclaimed As A Fountain In A Garden (Tarang Press. Del Mar, USA, 2005) and Radha Sings (Rolling Drum and Dark Child Press, USA, 1987). Her poetry has also appeared in Yellow Silk (Berkeley, California), Journal of Literature and Aesthetics (Kerala), and the anthology, Our Feet Walk The Sky (Aunt Lute Press, Berkeley, California, USA). Ms Kapur was a semi-finalist in the Nimrod/Hardman Pablo Neruda Prize competition. In addition to her three books of fiction (Ganesha Goes to Lunch: Classics from Mystic India (2007, Mandala, USA,), Rumi’s Tales from the Silk Road (Mandala USA and Penguin India 2009) and The Singing Guru (Mandala, USA, 2015; Jaico, India, 2015), five of her short stories have been published in Parabola (New York) and two in the anthology, The Inner Journey: Views from the Hindu Tradition (2007). Kamla was on the faculty of Grossmont College in San Diego, California for 18 years and taught creative writing courses in play writing, poetry, creative non-fiction, fiction, and courses in mythology, Shakespeare, and Women's Literature. Together with her husband, Payson R. Stevens (www.energylandscapes.com) Kamla lives half the year in a remote Kullu Valley in the Himalayas and the other half in California. Two pilgrims paused in a bamboo grove to rest on a hot summer afternoon. Nanak, ten years younger than his companion Mardana, hung his wool blanket and few meager belongings on a branch and walked to a tiny spring nearby. He removed fistfuls of dead bamboo leaves and rotting mulch, which had choked its flow, until the clear water overflowed into the adjoining land and fed the thirsty earth. “Come drink, Mardana,” he said to his companion. Sitting at the spring’s edge, Nanak cupped his hand and drank. Mardana took off his satchel, leaned his rabab—the musical instrument he was carrying—against a rock, and collapsed on the ground. He felt unable to move, yet severe thirst made him crawl to the spring, put his face to it, and drink like an animal, lapping the water with his tongue. The cool liquid flowing into his parched mouth revived him a little, and he returned to the spot by his rabab and lay down as one dead. Nanak proceeded to wash and clean himself in the spring before clearing the ground of stones, spreading his blanket, and lying down on it. Soon he was fast asleep. Mardana lay in a heap, too tired to remove the pebbles or to spread his blanket beneath him. A tired body and an overactive brain kept him too agitated to sleep. He was hungry and uncomfortable, and a vague discontent at having been away from the comforts of home for so long began to brew in Mardana’s mind. It quickly turned into a full-blown, raging unhappiness. How long, how very long have I been away from home? Do I even have a home? Mardana asked himself, repeating the question that had been foremost in his thoughts for quite a while. Twenty years—maybe more, twenty-two, or three—what am I doing so far away from my homeland, from Fatima, my children, and my dog? He looked at Nanak, who he called Baba, resting in the shade of the bam- boo grove, his arm folded under his head, his face radiant even in sleep. Why can’t I be like Baba, so certain and centered, so detached from comfort or discomfort, satisfaction and hunger, prosperity and adversity? Mardana thought, stretching upon the ground, longing for something soft beneath his body and head. He felt coarse and altogether too human compared to Nanak. Mardana was aware that he was rather attached to his appetites and vacillated too much between despair and joy. He felt like a Persian waterwheel, some- times empty like the buckets clanking all the way down, and sometimes full and sloshing with sweet, clear water on the way up. He felt certain of the presence of God when things went his way, when he was provided for—with food when he was hungry, a bed when he was sleepy, and the unexpected boat or bullock cart arriving on the riverbank when his bruised and blistered feet screamed in pain. But in adversity, the thin film of his faith dissolved, and he was certain that this whole philosophic construct of God was nothing but a pipe dream. The image of the pipe brought with it a whole train of other desires. I could really do with a bowl full of bhang and a jar full of sweet red wine. All these hardships would be worth it if they were followed by some rewards. He recalled how once, when Nanak and he had returned home to Sultanpur after a long journey, Fatima had been angry at Mardana and told him to go away and leave her alone. Mardana, upset, had gone to the village bhang shop and had some in a hookah, sitting in a circle with others, all pleasantly high and happy. He had returned home in an amorous mood and made up with Fatima. Wah! Wah! Allah himself had descended into their bed and bodies that night! As Mardana recalled the scene, his fingers reached out and traced the contours of his wife’s absent body. Doesn’t Baba ever miss his wife? Mardana wondered. He hardly ever speaks about her, or even mentions his two sons. He is wedded to an intangible thing he calls Beloved, Husband, Guru, Akal Purakh, and the Timeless One. But I miss Fatima and the comfort of her in my arms, in our bed, her delicious cooking, and her ministrations when I am sick. Will I ever be with her again? Will I ever reach home and lead an ordinary life? Mardana turned his mind to the image of the kind hostess in the last village where Baba and he had rested. Her features and face swam before his mind’s eye: her slim brown hand as it handed him the full glass of cinnamon- and cardamom-spiced milk; the shape of her body as she labored over the fire to make their meal; her arm jangling with bangles as she brought him the dinner plate arranged with delicious food; her face with its large, dark eyes, and the tiny dimple at the corner of her lips as she smiled at him in the morning while giving him a warm honey ginger drink. The more Mardana thought about her, the more his senses were inflamed, and the more agitated he became. How much have I missed by following Nanak these many years? What have I got in return for following him, hungry and weary, for thousands upon thousands of miles, up and down steep cold mountains, through hot and windy deserts, over stormy seas and flooded rivers and under thunderous skies? What do I have except an imperfect and chimerical wisdom? Wisdom is a poor substitute for real life, for simple human pleasures and joy. One doesn’t live forever, and the purpose of life is not some insight that comes and goes like fairy dust in the eyes of deluded fools. Baba talks about vague, intangible things, and I want certainties now, a life where the senses are fulfilled and at rest. Perhaps an ascetic life suits Baba Nanak, but I have had enough! Sitting up, Mardana broke off a stalk of bamboo and peeled it to get to its edible heart. Chewing on the tender shoot, Mardana wondered why he followed Baba like a meek lamb. Lambs always get slaughtered in the end, he thought. Baba’s music and voice have entrapped my soul, and I can’t break away from the spell! Mardana stopped chewing as this thought flashed through his mind. Rage rose in him like a whirlwind. I have been cheated out of life by this magician! It seemed to Mardana that for the first time in his life he understood with perfect clarity what he must do: break away from Baba and leave, never to return. He looked at Baba sleeping peacefully; he looked at his satchel that contained the quills, ink, and book in which he, Mardana, had written down Baba’s songs in painstakingly neat handwriting; he looked at the rabab, leaning against a boulder, the intricate mother-of-pearl inlays around its sound hole shining in the moonlight. In his fury he wanted to pick up the instrument and dash it to pieces on a boulder. Mardana saw the dense jungle surrounding the small clearing in which they rested and was momentarily afraid at the thought of leaving, but his desire for freedom pushed the fear away. Enraged by Nanak and his rabab, Mardana stood up, turned, and walked away, determined not to look back upon the causes of his frustration. He walked with one clear intention—to get as far away as possible as fast as he could. Mardana forged ahead, re-creating in his mind the amorous night with Fatima. He was raging and he was angry at nature, kudrat, that gives a man desires only to thwart them. When he quieted down enough and looked back, so many trails led away from him that even if he had wanted to return, he couldn’t have found the way. “Just as well!” he said and continued down the same path, images of his longing crowding his mind. Mardana paused. He clearly heard Nanak’s voice in his ears: “Why should I forget those with whom I have exchanged hearts?” He looked around, wondering if Nanak had followed him, but there was no one there. “The magician has gotten into my mind!” He clutched at his head as he fought his way through the darkening bushes. The sounds of beasts roaring, growling, and mating in the forest only inflamed his mind with feverish desire. Mardana thought about all his fights with Fatima and all the things he didn’t like about her, trying to pump up his resolve to seek fulfillment with another, convincing himself that his hunger must be quickly gratified. He punched his way through the thick underbrush into a large, circular clearing in the forest and stood transfixed at the marvelous sight before him. The landscape was completely transformed from the jungle of a few moments ago. Mardana couldn’t even tell if it was night or day. Perched on a craggy hill that spiraled up, Mardana saw a formidable and imposing fortress with battlements, domes, and turrets. From its massive iron gate protruded huge brass spikes and hanging bronze bells. It seemed to Mardana that the fortress somehow hovered in the air and was lit by soft lights from both below and above. A valley with a meandering stream and a small village rested at the foot of the hill, in the shadow of the fortress. A festival and a feast were in progress, and enchanting flutes, strings, and drums filled Mardana’s ears as he moved toward the scene before him like an iron filing caught in the gravity of a large magnet. Slaughtered goats were being skinned and cut open, and women in colorful clothes were harvesting their organs in neat piles: skins for carpets, water bags, drumheads, saddlebags, and parchment; guts for twine and stringed instruments like rababs and dilrubas; hearts, livers, and tongues to be roasted as special delicacies. Some goats, minus their heads, were roasting on spits above open flames. The aromas of herbs and spices and the smell of dripping fat wafted to Mardana’s nostrils as he salivated over the scene, his teeth involuntarily masticating over the promised meal. Wah! Wah! Mardana thought. This is the place. My heart has come home! His intuition was confirmed when several of the women in colorful, sequined ghagras and cholis, sweet smelling and lovely to behold, noticed him and let out screams of delight, as if they had been waiting just for him. As they ran toward him, Mardana scanned their faces, each one lovelier than the next. His gaze rested on the one who wore a red dress. She smiled directly at him, and Mardana felt himself drowning in her eyes. Drawn to her without volition, he began walking toward her. All of the women immediately surrounded him, caressed his arms and back, and carried him as if on a wave, into the house. “Mardana, Mardana, this is Maya’s magic, don’t fall into her entangled web! Your ego is creating these illusions.” Mardana heard Baba Nanak’s voice in his head as he bobbed on the crest of the wave. Oh Baba, stop all this moralizing and let me live! Mardana replied irritably. I’ve had it with your magic and am ripe for some of Maya’s now. A warm bath awaited Mardana, and the women took turns pouring water over him and scrubbing him down with fragrant soaps. His eyes followed their movements while his heart and body swelled with pleasure and gratitude to Allah for fulfilling his secret desires. His gaze lingered on the woman of his choice, their eyes meeting every now and then, hers coy, his probing. She looked at him submissively, adoringly. “What’s your name?” Mardana asked. All of Mardana’s doubts vanished. He knew that the reciprocal, bountiful nature of the universe had helped him to manifest his desires. I have created this with the power of my thoughts! Yes . . . I have learned much from Baba and am no longer the disciple, but a master creating magical realities! The women teasingly dried him with soft towels, carried him to a canopied bed, laid him down on soft sheepskin rugs, and rubbed him down with fragrant, heady oils. They brought him the hookah, its bowl full of bhang buds, resins, and other fragrant herbs. Once he had his fill they massaged him and fed him by putting grapes and other berries into his mouth with their hennaed hands. All of them wanted Mardana. Juices dripped from the corners of his lips as they stroked his hair and giggled. He was at the pinnacle of his pleasures; his every desire had become flesh, all because he had stumbled upon the truth about the power of his own will. In a moment he sketched out his future. One of the adjoining huts would be his own little home, his corner of the universe. It would be comfortable, not lacking in provisions, and Razaa would be there to service his every need. She would be sweet and compliant, like Fatima early in their marriage, before she aged and became more willful and sharp tongued. The lord or lady of the fortress would recognize his greatness as a singer and a rabab player, make him a court musician, and honor him with a small kingdom. He would lack for nothing for the rest of his life. The women continued to dress him, and then put a chain around his neck. The chain felt tight and heavy. Never mind, he thought. Let them have their way with me! The perfume they put on him seemed to have a whiff of something like the urine of sheep or goats, but Mardana ignored the smell. Their singing, too, seemed like it had turned from mellifluous to cacophonous, like the agitated bleating of goats before slaughter. Perhaps he had overhead them slaughtering one for his dinner tonight. He was ravenous and couldn’t wait to eat. Mardana recalled a feast he’d had in Emperor Babar’s tent once, long ago. Just the thought of it made him salivate: A plump, whole, roasted goat was brought in on a silver platter with carrots, peas, and potatoes garnished with roasted almonds, fried cashews, and raisins. There was fragrant basmati rice and all sorts of condiments and fruit. Mardana had torn off the leg of the goat and eaten it. Babar’s musicians had given him some bhang, and the drug had made the food taste a hundred times more delicious. Babar knew how to treat his musicians, unlike Baba, who wanted his minstrel to feed on air. Bhugat gian! Mardana scoffed. For food, wisdom. Enough of poor asceticism! God himself gave humans these appetites, he reasoned. The women continued laughing. Mardana was dreadfully confused. What was happening? Why was he standing on all fours? He looked down at his feet and saw hooves at the end of thin, hairy legs; he looked up and saw that the women stood far above him instead of at eye level. Through the corners of his eyes he saw the flapping of long ears, and when he squinted, he saw twisted white horns on top of his head. “Am I hallucinating from the drugs? What is happening?” he tried to ask, but all he heard was a frenzied bleating and the answer of roaring laughter from the women as they danced around him in glee. One of the women stroked his neck and pulled at the rope around it. In a flash of insight, Mardana understood that he was the goat he had hoped to eat for dinner! “Sacrifice?” bleated Mardana. But the women couldn’t hear him. Singing and dancing, they led him out of the house and into the backyard. They opened an iron gate and led him into a dank, dark pen. Immediately, a strong and offensive odor assaulted his nose.